Push Plastic is an Arkansas based company that makes high quality filaments for a relatively cheap price. The company sells 100% USA made products and has been around for a long time. This is a brand you can trust. Push Plastic makes fantastic PLA and ABS, but it is sometimes overshadowed by Chinese importers like Hatchbox. But the quality of Push Plastic filament is more consistent from one spool to the next. This makes their slightly higher prices worth it. Push Plastic is a relatively old player in the filament industry. With over 20 years of experience in plastics manufacturing, the owners of the company know what they are doing. Push Plastic offers high quality plastic filament for a price similar to other leading value brands, like Hatchbox. And the company is clearly positioning itself to compete with the cheaper filament brands because they have sensed customer demand for quality and consistency. While in the past there have been some issues with Push Plastic clogging and jamming, Push Plastic quality control has radically improved. The quality of their PLA and ABS has improved to the point where they are basically indistinguishable from other leading brands. In fact, we feel confident in saying that Push Plastic is one of the more underrated filament brands in the industry. Push Plastic is 100% virgin material, meaning that they don’t use any recycled plastic in their filament. It has no impurities. One of the other more compelling aspects of Push Plastic is that they are a completely homegrown 100% USA company. This allows them to offer unique deals on shipping and sales on a daily basis. They have a fantastic website and you can check there for these deals any time. Also, Push Plastic is known for offering fun competitions and holiday sales. But by far the most interesting product they sell are massive 10 kg, 25 kg, and even 50 kg filament spools. That means you don’t have to swap out a new spool every time you print a kilogram of filament. Nice huh? This company is clearly growing aggressively and will likely continue to improve in the future. The owners of Push Plastic have decades of experience in the Plastics industry. Specifically, the owners ran a plastic injection molding plant for 20 years. Due to this extensive background in plastics, the owners decided to give extrusion and 3D filament productions try. So far, their extruders have been successful and their filament has gained them a significant following. Where Does Push Plastic 3D Filament Come From? Where Can I Buy It? Push Plastic is produced in Springfield Arkansas. You can find Push Plastic filament on Amazon and on the PushPlastic.com website. A note about Ebay: While there is a limited selection of Push Plastic filaments available on eBay, the price tends to be much higher on eBay than on the website or amazon.com. Also, the deals and sales that Push Plastic frequently offers are not usually available on Amazon or Ebay. One other thing to keep in mind is that if you happen to live near Springfield, Arkansas, you can visit their headquarters and pick up filament at a discounted price in house. The thing about Push Plastic that you need to know is that they are not trying to sell you anything cheap. You can trust that, unlike other filament companies out there. They are trying to produce a reliable, consistent quality plastic filament for a reasonable price that doesn’t break the bank. This means that their product is priced in the middle between high end filaments and cheaper brands. So for instance, Push Plastic tends to be cheaper than other high-end filament companies like ColorFabb. But at the same time, the quality and consistency of their products combined with a good range of colors will give you a similar experience as these higher end filament companies. Moreover, because Push Plastic is not simply importing cheap filament from China, the company has much more control over the quality and consistency of their product over time than companies like Hatchbox and Inland. The best place to find their products for the lowest price is on Amazon and their website. You can often find sales on these filaments around holidays and major events. Sometimes Push Plastic will offer discounts on orders over $60 and free spools as prizes for contests. They are very active on social media and have a great online presence, so look out for these offers on Twitter and Facebook. The range of colors that Push Plastic offers is great, at around 30 colors for PLA and ABS. They offer multiple shades of yellows, blues, greens, reds and whites. The company also offers an interesting selection of 9 PETG colors, but has a limited range of shades and colors for other specialty filaments such as wood, carbon fiber and HIPS. The one thing that really helps their PLA line up stand out from other brands is the range of specialty colors, such as metallic, fluorescent, and earth tone colors. The colors are consistent from one spool to the next and have a deep quality to them that translates well into prints. You can also purchase these awesome printed color tags. With these, you can examine the colors and materials before you buy an entire spool so that you know what you are getting. Push Plastic prints beautifully. They are very easy to work with. The PLA doesn’t even require a heated bed. If you see negative reviews online about texture, that issue has been fixed. In the past, Push Plastic filaments sometimes had a strange texture out of the box. It was very rough and almost felt like sandpaper. But this isn’t much of a problem anymore, and if you do happen to get a spool like this, Push Plastic is more than happy to replace it for you. Make sure you take advantage of their awesome customer service because that rough finish can ruin your prints. Again, most of the time, the texture is great and Push Plastic tends to have a very smooth finish on the prints. The brittleness and strength of prints is very much in line with what you would expect from other brands. No problems there. Same with color saturation. The printed parts are exactly the color that you expect them to be from the pictures online. The great thing about Push Plastic is that they have focussed on a core business of PLA and ABS plastic filaments. They do an amazing job producing these two types of plastic at consistently high quality. The Push Plastic PLA is the premier product from this company. PLA is far and away the most sought after plastic for 3D printing right now. That’s part of the reason that Push Plastic has put so much effort into their PLA. The quality of the PLA is very high and most people who buy a spool of it become instant fans. Push Plastic PLA filament print temperature is the standard range of 190-210ºC depending on the printer and ambient temperature conditions. There are almost 35 colors of PLA available on the website, and a more limited selection on Amazon. 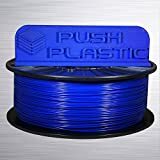 Push Plastic filaments are not consistently available on Amazon so if you are looking for a specific color, head over to their website to check out more. ABS from Push Plastic is also very high quality. A few years ago this ABS was not as consistent as it is now so it’s important to recognize that some of the reviews on Amazon and other websites for this ABS may not reflect the high-quality that Push Plastic ABS is known for today. Push Plastic vastly improved their production to the point where some of the problems that people were having, such as rough surface texture and clogged extruders nozzles are no longer occurring. The print temperatures for this ABS are a little bit higher than normal. But they are otherwise very easy to print with. And you can expect the same strength and durability that all ABS is known for. PETG filament is quickly becoming an industry favorite. Customers are discovering that PETG filaments have the strength and durability of ABS but without the associated smell. PETG is also easier to print with than ABS and has some other qualities similar to PLA. Push Plastic PETG comes in a variety of colors that other brands don’t offer. There is clear translucent blue and green, desert tan, amber, black, silver metallic, red and white. That is more colors than most brands offer for PETG filaments. The website is easy to work with and very intuitive. You can find all of the products that they offer on it and order them at the lowest prices possible. You can also find some deals although those are more likely to be found on their social media, which includes Facebook, Twitter and Pinterest. The packaging is standard with plastic wrap and a desiccant packet to absorb moisture. And the spool design is your standard black hard plastic spool. The website is great and easy to work with. You can find all of the products Push Plastic has to sell plus some great deals. There are different kinds of information about filaments and 3d printing news to read about on the Push Plastic website. The only problem with it is the lack of information about the company itself. It feels a little bit impersonal with not too much information on the about page. In fact, we recommended that they just remove the about page completely if they aren’t going to fill it out any further, and they did that. Some customers like to know a bit more about who is behind the filament company and why they are selling filament in the first place. And Push Plastic has a great story, founded by two plastic manufacturing experts. So it is too bad they didn’t fill in their about page more. That’s a small issue though. Overall, the website is very easy to use and beautifully designed. Push Plastic packaging is simple and effective. Push Plastic spools are wrapped in a designer plastic with an interesting rough texture. It is not shrink-wrapped, but it does include a desiccant packet. The shrink-wrap is important for preventing humidity from entering the package itself and Push Plastic should consider building this into their packaging in the future. However, the box is well-designed and the overall presentation of the packaging is pleasing. There are two types of spools: simple black plastic with a regular 2 inch diameter center hole, and the master spools you see above. The logo is on the front of the spool and is easily visible. While the logo is small, you will still be able to identify the spool among the other filaments in your collection. You can purchase extra blank spools in case you need them for spooling filament. BIGGEST SPOOLS EVER: Push Plastic offers the largest filament spools ever. At 10kg, 25kg, and 50kg, these spool are absolutely massive. These spools allow you to print continuously for days and weeks on end without needing to change out a spool. You might need to print a new spool holder for your printer though, and maybe add some support so the your rig and hold the weight. Overall, Push Plastic is a great company making high quality filament at a good price. Recently, the price dropped to put in the same category as Hatchbox and eSUN. But it is cheaper that ColorFabb, and unlike MakerGeeks and Hatchbox, the owners of Push Plastic have 20 years of experience in the Plastics industry and are well-versed in these materials. Additionally, the website is intuitive to use and the quality of the materials that Push Plastic produces is increasing is improving every year. You can get great deals on their website and social media pages. Somehow this company seems to have flown under the radar of most new 3D printer enthusiasts. It is really a shame that more people haven’t discovered this amazing U.S. company and we’re not sure why. Maybe this is due to the fact that the company is not as well marketed and hasn’t developed the massive online following it deserves. Maybe it’s because a few years ago it got some bad reviews online due to some problems with their filament quality. But those problems have now been resolved and whatever the reason, customers who try Push Plastic today usually become long-term fans of the brand immediately. For many customers, the quality and color range of over 30 different color tones available for the PLA plastic and 9 colors of PETG are enough to make them repeat buyers. For others, the interesting specialty filaments such as carbon fiber and polycarbonate plastics are what draw them in. If you head to Amazon or the PushPlastic.com website today and buy a discount on one of their sales, then you will see how good this company is and how much potential there is for it to grow in the next few years. Get a spool now on Amazon and give it a shot. Best check their prices again. A 35% increase in less than 1 month?